I used to be a fan of the Windsor. Whilst at school, I trained myself to tie the perfect version and was very conscious at social functions about my knot and the knots of others. It made sense that I should be so faithful, for I was a speedy devotee of the cutaway collar which, because of its wide spread, is considered to be more befitting of an enormous Windsor ‘doughknot.’ I was eventually turned against the alarming size by reviewing photographs of myself, an emaciated youth, with a thin neck and a fat knot; it was an unattractive contradiction that made the tie look heavy and simplistic. I surfed around for a style that I did not find so visually revolting and settled on the four-in-hand which I now tie, like my father, into a smallish knot. If you tie a tie properly and wear the right collar size, you shouldn’t see ‘the bits’ either side of any knot. Prince Charles, for example, is fond of smaller knots and wider collars and manages to tie a tie without any ‘bit’ exposure. Firstly, he knows that the tie should be secured to the top rather than the middle or bottom of a collar, and that the ‘bits’ are correspondingly squeezed into the crevasse under the ridge of the collar. I choose this style because I believe that it averts attention from that area; the Windsor, so noticeable in size, attracts attention and this means I spend a great deal of time looking at people’s chins which is not a pleasant pastime. 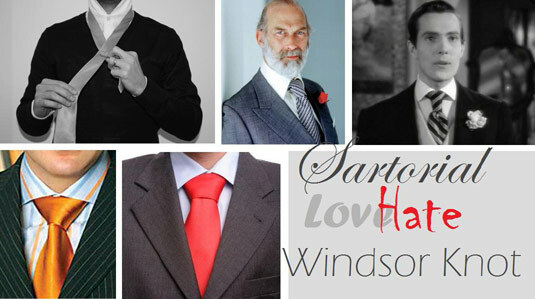 However there are those who wish to attract attention to their neckwear and to remove the ‘presentation’ from their silk is simply not an option; the Windsor is a presentation knot, one for men of confidence and self-consciousness. These men do not wish to be seen to be strangled in an attempt to convey subtlety. They believe in proportion and it confuses them that others can be so generous in tie width and yet so mean in tie knot. The Windsor is frequently cited as the most comfortable of knots, remaining tightly tied whilst still allowing ‘breathing room’ between the collar and neck. For me this is it’s main benefit, and I do concede that certain people, for example Prince Michael of Kent, wear it very well but those who experiment with it tend to overegg it rather which results in something that looks less like a cravat of royalty and more like an attempt of a sartorially illiterate footballer. I think the key is to follow the aesthetic of Hurd Hatfield and HRH in the pictures above (top right); make the knot more conical than triangular (see bottom left) – and do not flatten the wretched thing (bottom centre). Prince Michael does not wear a Windsor. Like Edward VII his ties are of a wide and thick construction that produce a large knot. The Windsor knot is not required. He certainly wears kipper ties of a thick silk which help to produce the thick knot but many of his ties are very short indeed, suggesting he has used a large amount of the tie to produce the knot which, in most tie examples of that shape and size of knot, means a Windsor. If the Windsor wasn’t required, it’s difficult to see how a simple four-in-hand produces such a comically short tie. I don’t think Edward VII wore kipper ties though. Perhaps you meant Edward VIII? His grandson? Apologies for the glaring and upsetting error. Fg the “it’s” is the possesor of the benefit. I think the apostrophe is correct. One would write “this is Winston’s main benefit”. “Kipper tie” is short by the nature. The name, already, comes from its shape that looks like a short, stubby fish hanging from your neck, head down. And yes, thus, Prince Michael uses four-in-hand, which is the suggested knot for kipper ties.